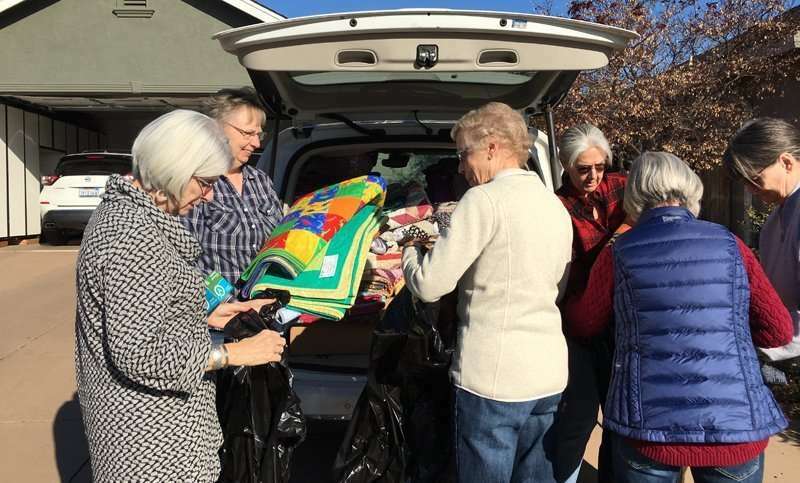 Country Pines Quilt Shop friends and employees have been sewing non-stop to help provide, “comfort, warmth, nurturing, healing and a sense that others care,” to the survivors of the Camp Fire, according to shop owner Laura Roberts. Rebuilding Paradise after the Campfire will be a long process. Viewing online images of tent cities in areas such as parking lots and the fairgrounds offers only a glimpse of the task involved to provide basic shelter for displaced families and individuals. Thousands of people who recently enjoyed evenings on comfy couches before cuddling up in their warm, familiar beds have had those daily comforts stripped away and are now struggling for ways to meet basic human needs. 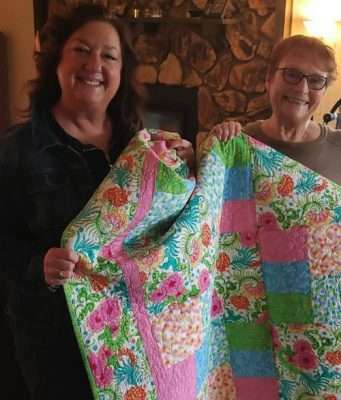 Roberts was quick and decisive about using her shop, materials and skills to wrap her fellow quilters — 140 members of the Paradise Ridge Quilt Guild — in a homemade hug to help provide warmth and show support. The project could not have been successful without many hands cutting, sewing and constructing. Numerous local quilters have contributed to the endeavor. 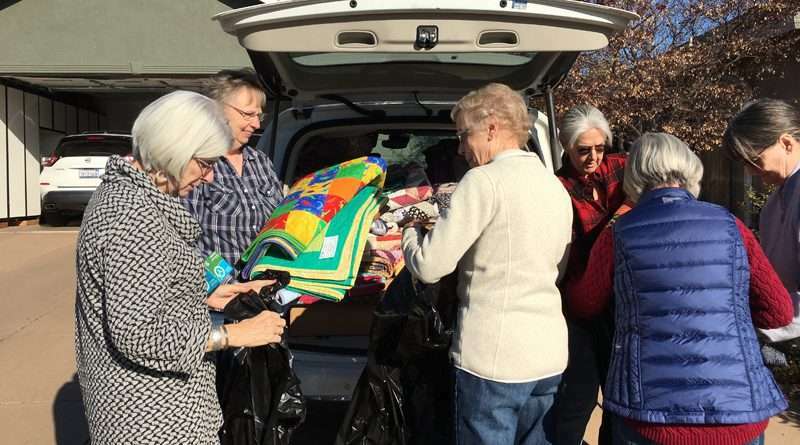 Locals such as Laura Byers, who in between caring for her family and horses plus working as a hair stylist, still managed to complete four cozy quilts to provide warmth and hope for Camp Fire survivors. e fast friends while working together at Beauty Corral over 30 years ago. Reichenberg — a 17 year resident of Paradise — relocated to Chico after losing her home in the Camp Fire. Country Pines Quilt Shop on Richmond Road was established in 2008 with a larger 1,600 square foot building constructed in 2016 to handle the traffic of its many devoted customers. But, for shop owner Laura Roberts this journey started long ago. Roberts’ quilting heritage spans generations. Even now she and sister Nancy are working on multiple quilts that belonged to their grandmother. However, putting their personal projects on hold, the pair are currently focused on constructing and facilitating quilts for survivors of the camp Fire. According to multiple sources, the family run business is well known for supporting charitable causes. President of the Paradise Ridge Quilt Guild, Becky Ray, knew of Laura Roberts and Country Pines Quilt Shop long before the tragic fire decimated her hometown of Paradise. Sadly, upon their return several days later, the Larsen’s discovered their recently remodeled home reduced to a pile of dust and ash, and two of the three cars melted into carcasses of metal. The remaining car was the one full of quilts. Imagine, after a lifetime of working, planning and saving, the only possessions Teresa and Bob Larsen were able to salvage was in the form of a vehicle loaded with quilts. Still, the couple finished what they started out to do and gave them all away. Ray’s home was one of the few spared but she shared that it can be difficult to rejoice when friends, neighbors, co-workers and family have lost so much. The Country Pines Quilt objective was to gift a quilt to every member of the Paradise Ridge Quilt Guild. So, of course the truckload of handmade heirloom creations Roberts delivered included a quilt to be presented to Teresa and Bob Larsen — bringing the giving full circle.